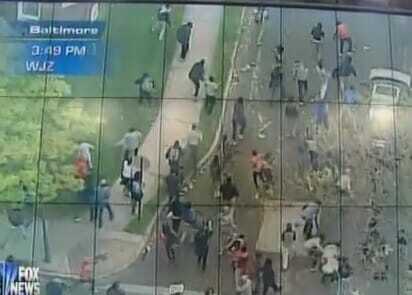 CBS News producer Lindsey Boerma reported from the scene of the Baltimore riots near Mondawmin Mall that reporters are being attacked by protesters. Their cameras and equipment are being smashed and stolen. Some rioters, she said, told reporters they would try to get the equipment back. Protesters hurl rocks at police. Boerma said the violence is much worse than Saturday’s riot. She said the riot Saturday involved property damage but not attacks on persons. Boerma said she has seen several people with head wounds. Boerma’s report was made on a live online report by CBS News. UPDATE: Baltimore police said seven officers were injured in today’s rioting including broken bones. One officer is unresponsive!